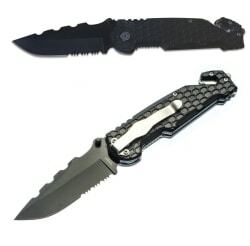 As one of its daily deals, 13 Deals offers the Pocket Knife with Seatbelt Cutter and Glass Punch for $3.49 with free shipping. That's tied with our mention from last October, $9 under the lowest price we could find for a similar model elsewhere, and among the best prices we've seen for a pocket knife. It features a 3.5" stainless steel blade. Deal ends today.